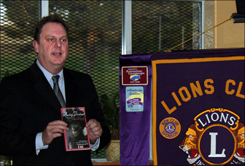 Belle Fourche attorney Michael Trump last night (5/12/11) gave Lions a lively history lesson about old Deadwood, drawing upon research he did for his 157-page book Raiding Deadwood’s Bad Lands: Its Illegal History of Prostitution and Gambling. 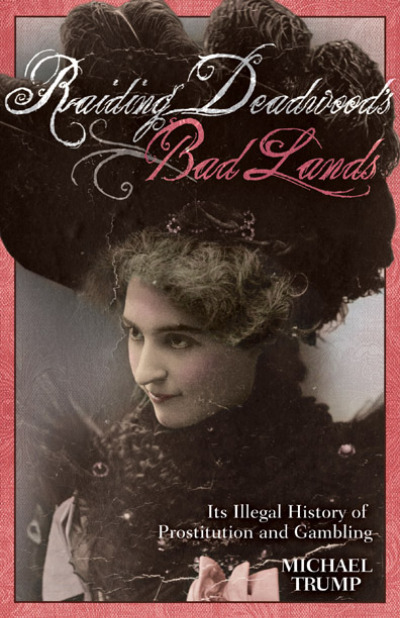 When Deadwood was chosen as the only city in the United States to be designated as a National Historic Landmark in 1964, prostitution was still legal -- and would remain so for another 16 years. Trump passed around a copy of his, which chronicles the long history of the red light district before and after prohibition. It's an Adams Museum & House publication. If Trump's professor was intrigued by the topic, so were the assembled Lions, as he told the story about how well-known television and movie actor Woody Harrelson's father, Charles, had been charged in the 1979 killing of a federal judge in San Antonio, Texas. Although a link was apparently never fully documented, a Deadwood brothel was believed to be a site where investigators were seeking evidence related to that case. The elder Harrelson was later convicted of the crime and sent to prison. He died in a Colorado prison in 2007. 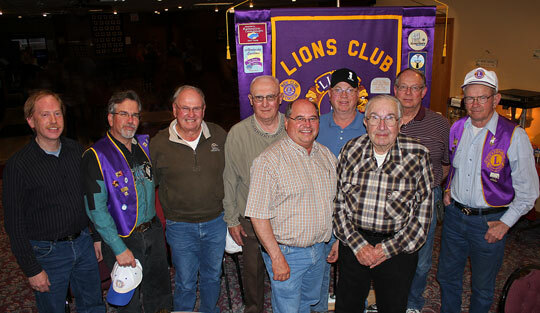 In a short business session following Trump’s presentation, Belle Fourche Lions reaffirmed their focus on “Sight and Sound” projects that relate to the long-standing mission of Lions clubs. The club has expanded its scope of community service projects over the years, but declined to back away from any of the many worthwhile initiatives in which members have been involved – ranging from building park shelters to roadside trash pick-up. 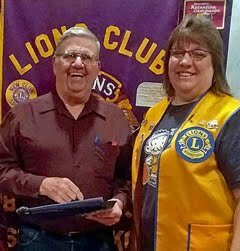 Club Treasurer Rich Drabek was again honored for his continuing good work in promoting Lion membership. 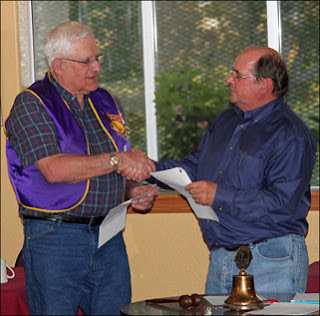 He was presented with news pins and certificates documenting his “Membership Excellence” by bringing two new members into the club last year. 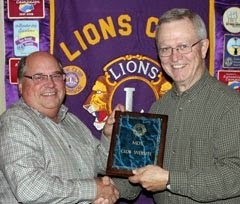 You'll find the full-sized photo of this presentation and a wide variety of other club photos in our Lions Gallery. 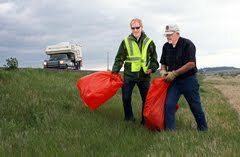 Chairman Harry Haivala announced that volunteers are needed for a Highway 34 trash clean-up on Thursday, May 26, just prior to our regular Lions meeting. 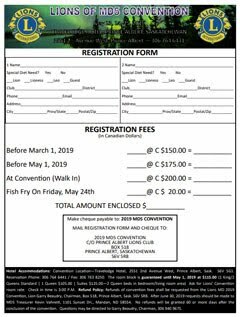 Volunteers will gather at the Country Club at 5 o’clock and then re-convene later for our final meeting. 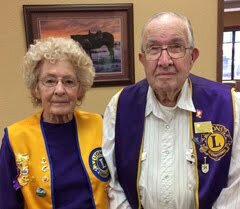 Belle Fourche Lions Club will mark its 75th anniversary next October, and it was agreed that the club will host a major event that month – inviting spouses and Lions members from surrounding communities to join us as we celebrate 75 years of service to the community! 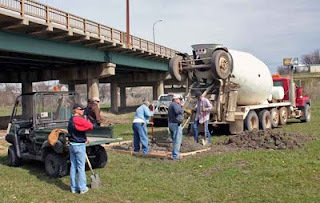 Another important enhancement is nearly complete along the Riverwalk in Belle Fourche, and several Lions Club members joined other volunteers and city workers today (5/3/11) to make it happen. 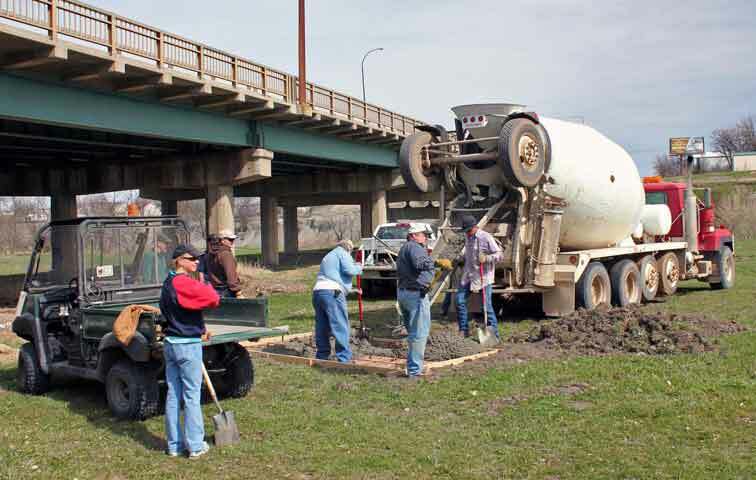 Concrete pads were poured and holes set for a new disc golf course along the river near the Chamber of Commerce offices. Lions Leo Orme, Rich Drabek, Mike Reade’ and Ron Ensz – armed with rakes, shovels and trowels – were part of the work force that showed up on what turned out to be a splendid spring morning. It wasn’t a day too early, since some forecasters are predicting rain in the next few days. 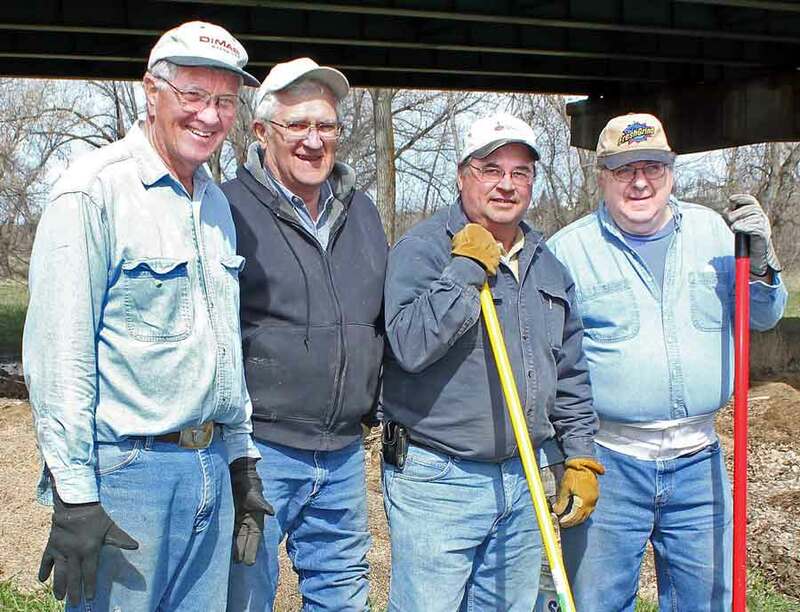 According to Susan Peterson, one of the committee folks involved with the project, there’ve been lots of volunteers who’ve been working hard to further develop and enhance areas along the nearly five miles of walkways throughout the community. 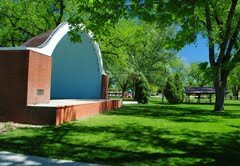 disc golf course along the Belle Fourche River.. The nine hole course should be complete in about two weeks. “We’re hoping to have a ribbon cutting around June 18th, along with a disc golf tournament,” Peterson told us. 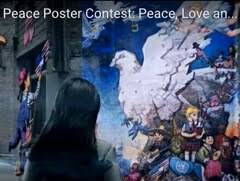 She acknowledged that many businesses, organizations, and individuals have been involved with the project – but she specifically recognized Pioneer Bank & Trust and the Clarkson family for their support. City workers were a big part of the Tuesday work project, and Rapid City engineer Scott Caeser provided technical guidance on the installation of the new course. 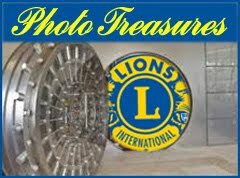 We snapped several photos of the work party, and you'll find them displayed in our Lions Gallery. 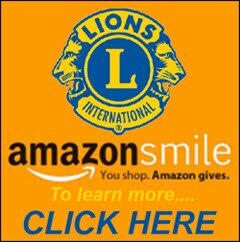 Hats off to Lions and others who’ve contributed time, talent and financing to another worthwhile community project.